Earlier I spoke about modeling the math to simulate the calculations that I will be using in my home grown energy monitoring system. I think I have a good enough grasp on the math to come up with the algorithm to use in the software. Specifically, the computation of RMS values and average power. The simulation implemented both these and the integration functions to compare results. We are dealing with low frequency power line signals of 60hz which in theory we need to sample at 120 times per second. The reality is that there will be higher frequency components such as harmonics and we would need to sample at a higher rate capture those effect and ensure we can compute true RMS values. Don Lancaster’s Tech Musings provides an excellent summary about measuring power s and pitfalls in trying to measure it. I think I have enough theory and now ready to start building something. I used Excel to enter the power calculations on a simulated data set (voltage and current). I later wanted something more responsive to what-ifs and designed for mathematical computation. I stumbled on a MatLab like open source tool cal GNU-Octave. I decided to download and install the tool to enter basic power calculations. What I like about this tool and like Matlab is the ability to manipulate matrices and vectors. I can set up calculations for my power without resorting to annoying for loops. With my short attention span, I liked this. For giggles, I wanted to use Octave to calculate and plot power curves. I know from sampling theory that we need to sample at least at the Nyquist frequency to be able to reconstruct the signal.The reality is we don’t live in an ideal world with perfect filters. More about sampling rate later. I created functions in Octave to generate a waveform. I can also import a text file with data values and compute the various types of powers as well. I wanted to test a couple of sunny day scenarios to ensure that my calculations were correct. I took two approaches. One I actually defined the function and let Octave integrate it. The other was to sample the function like I would in the software. Both yielded the same results. The table below outlines the expected and actual results. I also generated an odd current waveform that could occur in speed control via a triac or something and ploted the graph below. Intuitively one would expect the average power to be half of the sunny day scenario. The other half is reactive power. The following shows the power calculations for varying sampling rates. I wanted to brush up on the theory before I jump to the implementation. So back to basic circuit analysis. Note the average component “the DC offset” and the frequency of the instantaneous power is two times that of the voltage or current. 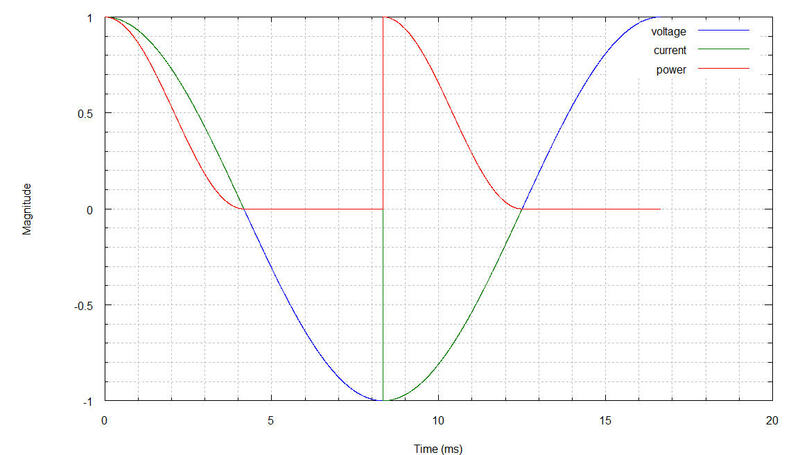 If one substitutes (4) into (5), (5) reduces to in a purely resistive circuit and assuming a sinusoidal waveform. In the power measurement solution for home, one can assume purely resistive loads and sinusoidal voltages and currents. That will come at the price of accuracy. The reality loads such as computers, UPS, etc. introduce inductance and capacitance which create loads that are neither purely resistive nor purely reactive. Furthermore, the current and voltage profiles are not clean sine waves. For non-sinusoidal functions, more complex integration needs to occur. Fortunately, in the implementation, there are some assumptions we can make to approximate the integration that makes the math much simpler. Nevertheless, an understanding of the math is needed to bend the rules. One last component needs to be addressed and that is the power factor. Equation (7) contains two components. The product of is known as the Apparent Power (S) and the as the Power Factor. The reference implementation shall compute the average power, Irms and Vrms. Using (7), one can compute the power factor. e.g. The power factor angle = The reactive power can be computed by the relation where Q is the reactive power in vars. Solve for Q and we can now compute all power related components. Now you may ask why the Power Factor Angle? We don’t even reference it? Well, you could use to compute the reactive power. What it does give me is sense of the types of loads I have in the house. A value closer to 0, implies I am operating in a resistive load. If you look at the power factor angle of a variable speed drill, at low speeds the angle would be far from zero. At full RPM the angle would approach zero. Why this is the case is because how variable speed drills work. That is a separate discussion. Next I want to model the math using a tool to help me make some assumptions for my reference implementation.